This is a traditional Vietnamese curry. The natural sweetness of sweet potatoes and coconut milk contrast against the curry spices, giving the dish a depth of flavour. 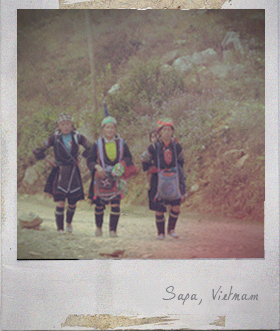 Sweet and strong – just like the Vietnamese women who I met in the mountain. 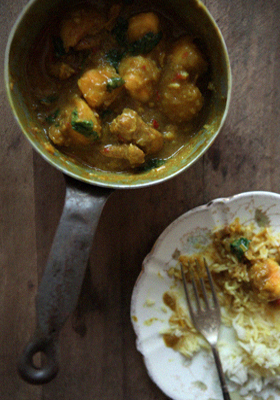 Combine the curry powder and ground turmeric in a small bowl. Place the chicken thighs in a bowl and coat with the half of the spice. Set aside. Heat the oil in a wok or heavy pan, stir-fry the chopped shallots, galangal and lemon grass over medium heat until fragrant. Add the spiced chicken, the rest of spice and chilli flakes and then stir-fry about 2 minutes. Add the sweet potatoes and stir-fry another 2 minutes. Add the nuoc mam, palm sugar, coconut milk and 50ml of water. Bring to boil, reduce the heat and simmer for 20 minutes or the chicken is tender. stirring occasionally. You are currently reading Vietnamese Chicken & Sweet Potato Curry at Fish Trip Cafe.